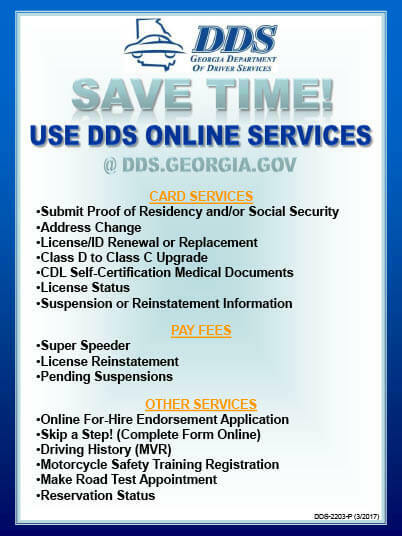 Save Time, Go Online—Try DDS Online Services! Register for a Motorcycle Safety course. ID requirements (see pages 10-11 for details). Be certain to take advantage of DDS Online Services and avoid an unnecessary trip to a Customer Service Center. DDS Online Services enable thousands of Georgia drivers to conduct many transactions via dds.georgia.gov and eliminate a visit to a DDS Customer Service Center (CSC). This saves customers valuable time and money. DDS does not charge an additional fee for choosing Online Services. A $5.00 discount may apply for eligible license types that are renewed on the internet. dds.georgia.gov and like DDS on Facebook! This manual is produced by the Governmental Affairs and Communications Division of Georgia Department of Driver Services.